Coloring Without Borders: "Should Scotland be an independent country?" Next fall, on 18 September 2014, the people of Scotland will vote in a referendum to answer a yes/no question: "Should Scotland be an independent country?" Yesterday, the ruling party in Scotland -- the Scottish National Party (SNP) -- put forth a "white paper" advocating for independence and explaining what might happen and what policies they would pursue if Scotland voted to remove itself from the United Kingdom. The SNP is a left-leaning party that has a majority of seats in Scotland's unicameral parliament. It's opposed by both the Tory and Labour parties, as well as the Liberal Democrats and other smaller parties. 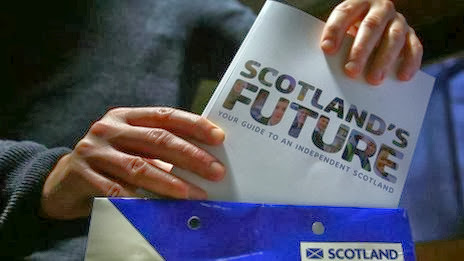 Titled "Scotland's Future: Your Guide to an Independent Scotland," the white paper is 670 pages long. You can read it here, if you have a lot of time on your hands. It's not a scholarly analysis of the issues. Rather, the white paper is a campaign document full of pledges to spend more money here, reduce spending there, make life better in these ways, etc. For Americans, it's kind of like reading a Republican or Democratic party convention platform -- hopes and aspirations, but not all of it will, or even can, come to pass. Most of the positions in the white paper will have to be either passed by the Scottish parliament (often referred to as "Holyrood," since the parliament building is adjacent to the Queen's Palace of Holyroodhouse in Edinburgh) or, much more precariously, negotiated with and agreed by the United Kingdom. You should keep in mind that the white paper is not what is being voted on by the public. At the polls next September, voters will only answer the yes/no question of whether Scotland should be independent from the United Kingdom. What happens after that is, to some extent, unknown. 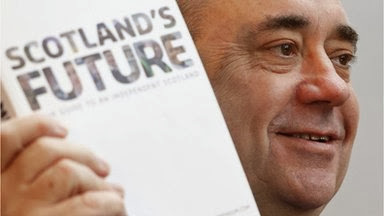 The SNP has put forward its white paper to reassure and convince a skeptical public that if they vote for independence their lives will not be greatly disrupted and they face a brighter future. The opposition parties, of course, predict dire outcomes. To me, the most striking thing about the white paper is the SNP's position that it would retain the pound sterling and keep the Bank of England as the "lender of last resort," somewhat akin to the U.S. Federal Reserve. Certainly not joining the Euro. Not creating an independent Scottish currency. Instead, Scottish monetary policy, interest rates, borrowing power, and so on, would be under the strong influence of the rest of the U.K. Of course, keeping this "sterling zone" has advantages such as easy trade with the rest of the U.K. It keeps economic changes to a minimum. It reassures businesses. 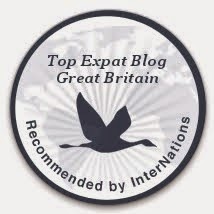 It makes it easy to continue pensions and other cross-border benefit schemes. I think it's a sensible course to follow, but it also takes away some of the power -- and the very point -- of Scottish independence. Moreover, the decision to allow Scotland to keep the pound sterling and rely on the Bank of England is up to the U.K., not Scotland. My assumption is that the U.K. would allow it, but not without some hemming and hawing, and perhaps some further negotiating concessions. I'm also struck by the total value of budgets and budget concerns here. Coming from America, and having worked on Capitol Hill for several years doing defense and foreign affairs work, I'm accustomed to much larger sums of money to be in play. The U.S. total budget for 2013 was approximately $3.8 trillion (though too much of that was deficit spending that adds to the debt). The U.S. defense budget for 2013 was around $682 billion. By comparison, according to the white paper, Scotland's defense budget at the start of its independence would be around around £2.5 billion (approximately $4 billion). In other words, Scotland's entire defense budget would be a rounding error in the U.S. defense budget. That £2.5 billion would support 15,000 troops and 5,000 reserves. Furthermore, I'm struck by the assumption that the EU and NATO will have no problem with Scotland breaking away from the U.K., and will simply immediately accept Scotland into the fold as just another country. Now, it's my assumption that both the EU and NATO will accept Scotland. But doing so without making Scotland jump through some hoops runs the risk of inflaming and emboldening separatist movements in other countries, such as Catalonia in Spain, the Flemish in Belgium, or perhaps folks in Northern Ireland again fighting about whether to join the rest of Ireland. The more that the current countries splinter, the more seats will be at the table, and the harder negotiating and operating will become. I'd guess that Scotland's assumption is basically correct, but it won't be perfectly smooth. For example, will the EU let Scotland join as a member but allow it to not join the Euro? The U.K. is a big bargaining partner and can keep itself out of the Euro. Scotland doesn't have that kind of leverage. The media here focus on a variety of economic concerns, including the currency, but the main headline is the SNP's pledge to provide up to 30 hours of childcare for 38 weeks per year (the same as the school year) for all 3 and 4 year olds, as well as "vulnerable" 2 year olds. By providing more childcare, the SNP says it will get more people to work and therefore incomes will rise and government revenue will grow. Why does Scotland need to be independent for such childcare spending to happen? The Labour party here snipes that the SNP could pass such a law now, but is using this proposal as a carrot (i.e., bribe) for votes. That's true, of course. But it's also just politics. The "key extracts" from the white paper can be found here. Also keep in mind that "independence" means Scotland will become just another of the "commonwealth of nations" with the Queen as its (nominal) head, like Canada and Australia. The United Kingdom will still continue, comprised of England, Wales, and Northern Ireland. However, there will be no "Great Britain," since that refers to the island of Britain and is made up of England, Wales, and Scotland. However, it is significant that independence is not dependent on a majority of the population support, but rather on a majority of those showing up to vote. I haven't seen polling here about the passion of voters on either side, but my sense is that the pro-independence crowd is much more passionate than the keep-the-status-quo crowd. If a lot of "No" voters think their side will easily win and thus they don't need to vote, then the vote tally could be a lot closer than it looks now. And, of course, we'll also have to see how things progress over the coming year. What gaffes will either side commit? Will there be an upswell of nationalist feeling after Glasgow hosts the Commonwealth Games in late summer? Will there be any major surprises nationally or internationally that shake up the electorate?